During the summer, Netflix released the second season of its thought provoking comedy, Bojack Horseman. Bojack Horseman mocks Hollywood and the film industry. The show takes place in an anthropomorphic world in which humans and animals live side by side. 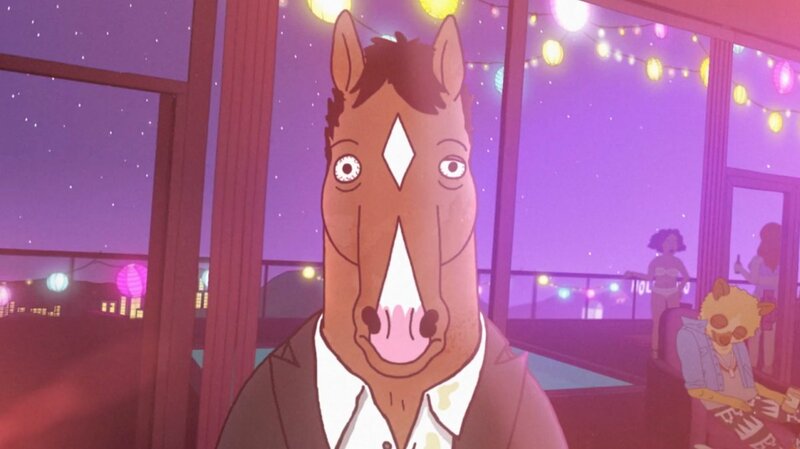 The story revolves around a horse named Bojack, an old Hollywood star whose fame drastically chuted upon the cancellation of his show, “Horsing Around”. Years later, he plans his big return through an autobiographical piece in the form of a novel. Although the first season received many mixed, average reviews due to the lack of creativity and freshness, the newly aired episodes quickly picked up the slack. Bojack seems to have matured and was even willing to seek change- during the first few episodes at least. The old favorites are also back. Characters such as Mr. Peanut Butter, a golden retriever that looks up to Bojack to the point of recreating “Horsing around” but with himself as the focus; Diana, his fiancé, who is also Bojack’s ghost writer; -, a teenage drug addict, in which Bojack sees a daughterly figure and tries to take care of, have returned in our favorite melodramatic horse’s life, creating a lovely chaos, as each tries to find themselves in the conformist world of Hollywood. Bojack Horseman is not only filled with satirical humor, but also explores character growth as we follow the disoriented main character through his journey to self-awareness. Catch up with the eye opening animation right now, before it’s renewed for a third season in 2016.